AJDABIYAH, Libya (Reuters) – Libyan rebels backed by allied air strikes retook the strategic town of Ajdabiyah on Saturday after an all-night battle that suggests the tide is turning against Muammar Gaddafi's forces in the east. Western warplanes bombed the outskirts of Misrata further west to stop Gaddafi forces shelling the city, a rebel spokesman said. One inhabitant said 115 people had died in Misrata in a week and snipers were still shooting people from rooftops. In Ajdabiyah, rebel fighters danced on tanks, waved flags and fired in the air near buildings riddled with bulletholes. Half a dozen wrecked tanks lay near the eastern entrance to the town and the ground was strewn with empty shell casings. There were signs of heavy fighting at Ajdabiyah's western gate. 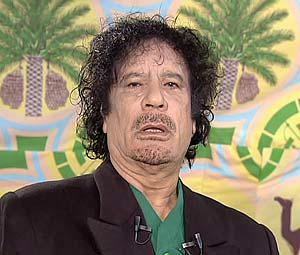 The decomposing bodies of more than a dozen Gaddafi fighters were scattered on the ground. An abandoned truckload of ammunition suggested Gaddafi forces had beaten a hasty retreat. 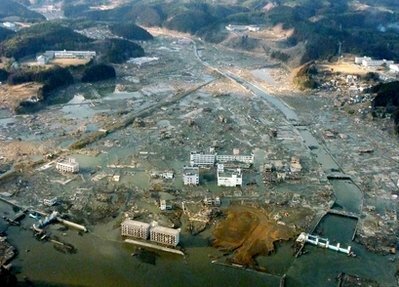 FUKUSHIMA, Japan – Emergency workers forced to retreat from a tsunami-stricken Japanese nuclear power plant when radiation levels soared prepared to return Wednesday night after emissions dropped to safer levels. The pullback cost precious time in the fight to prevent a nuclear meltdown, further escalating a crisis spawned by last week's devastating earthquake and tsunami that pulverized Japan's northeastern coast and likely killed more than 10,000 people. It was unclear what happened in the Fukushima Dai-ichi nuclear plant's overheating reactors after late morning, when the workers stopped pumping in seawater trying to cool their fuel rods. Officials gave only sparse information about the reactors. But conditions at the plant appeared to be worsening. White steam-like clouds drifted up from one reactor which, the government said, likely emitted the burst of radiation that led to the workers' withdrawal. The plant's operator reported a fire at another reactor for the second time in two days. SOMA, Japan – Dangerous levels of radiation leaking from a crippled nuclear plant forced Japan to order 140,000 people to seal themselves indoors Tuesday after an explosion and a fire dramatically escalated the crisis spawned by a deadly tsunami. In a nationally televised statement, Prime Minister Naoto Kan said radiation had spread from the four stricken reactors of the Fukushima Dai-ichi nuclear plant along Japan's northeastern coast. The region was shattered by Friday's 9.0-magnitude earthquake and the ensuing tsunami that is believed to have killed more than 10,000 people, plunged millions into misery and pummeled the world's third-largest economy. Japanese officials told the International Atomic Energy Agency that the reactor fire was in a fuel storage pond — an area where used nuclear fuel is kept cool — and that "radioactivity is being released directly into the atmosphere." Long after the fire was extinguished, a Japanese official said the pool might still be boiling, though the reported levels of radiation had dropped dramatically by the end of the day. Late Tuesday, officials at the plant said they were considering asking for help from the U.S. and Japanese militaries to spray water from helicopters into the pool. 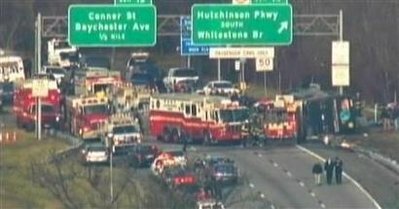 NEW YORK (Reuters) – The death toll rose to 14 on Saturday after a tour bus carrying sleeping gamblers returning from a Connecticut casino flipped over in the Bronx, shearing off its roof. The National Transportation and Safety Board was investigating what may be a hit-and-run accident involving a tractor trailer. The NTSB was trying to determine what caused the bus to swerve on Interstate 95 and topple onto a support pole for a highway sign. The pole sliced the bus in half along the windows, severing the rooftop from the vehicle. None of the 32 people on board escaped death or injury in the horrific crash, said New York City Police Commissioner Raymond Kelly. New York City Police said 13 people died at the scene and one other died at the hospital, bringing the death toll to 14. The Fire Department had said earlier that a 15th person had died, but this information was incorrect. IWAKI, Japan – An explosion shattered a building housing a nuclear reactor Saturday, amid fears of a meltdown, while across wide swaths of northeastern Japan officials searched for thousands of people missing more than a day after a devastating earthquake and tsunami. The confirmed death toll from Friday's twin disasters was 686, but the government's chief spokesman said it could exceed 1,000. Devastation stretched hundreds of miles (kilometers) along the coast, where thousands of hungry survivors huddled in darkened emergency centers cut off from rescuers, electricity and aid. The scale of destruction was not yet known, but there were grim signs that the death toll could soar. One report said four whole trains had disappeared Friday and still not been located. Others said 9,500 people in one coastal town were unaccounted for and that at least 200 bodies had washed ashore elsewhere. Atsushi Ito, an official in Miyagi prefecture, among the worst hit states, could not confirm those figures, noting that with so little access to the area, thousands of people in scores of town could not be contacted or accounted for. BENGHAZI, Libya (Reuters) – Government forces shot dead two protesters in the Libyan capital Tripoli on Friday, Al Jazeera television reported, as a popular uprising against Muammar Gaddafi closed in on his main power base. 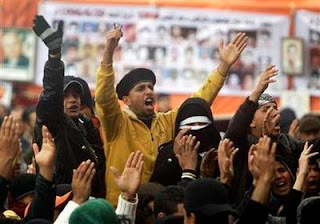 Pro-Gaddafi forces opened fire after hundreds of people in the Janzour district in western Tripoli started a protest march after Friday prayers, a resident, who asked not to be identified, told Reuters in an email. He said protesters were also shouting anti-Gaddafi slogans in Fashloum in the city's east, and another resident said security forces had fired into the air there. Al Jazeera said two people had been killed and several wounded in heavy shooting in several districts..
Tripoli and the surrounding area, where Gaddafi's forces had managed to stifle earlier protests, appear to be his last main stronghold as the revolt that has put the east under rebel control has also reportedly advanced through the west. Zawiyah, an oil refining town on the main coastal highway 50 km (30 miles) west of Tripoli, has on successive nights fought off attempts by government forces to take control, said witnesses who fled across the Tunisian border at Ras Jdir. WASHINGTON (Reuters) – President Barack Obama's administration will no longer defend a 15-year-old U.S. law that defined marriage as between a man and a woman, a major policy shift in favor of gay rights. 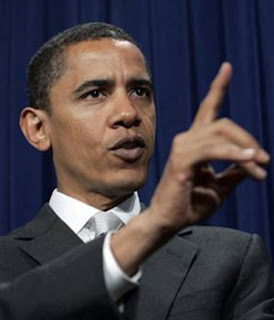 The issue of gay marriage has been a major personal conflict for Obama -- he has opposed it and instead favored civil unions -- and his policy reversal drew criticism from conservatives who said the move was a political one. Attorney General Eric Holder announced the change on Wednesday after a detailed review in recent weeks. He said the government now agreed with a U.S. judge in Boston who ruled in 2010 that banning gay marriages was unconstitutional.